Help-U-Sell Distinctive Homes broker/owner Marty Castro donates $100 from each transaction to a local charity. His office closed 12 sides in November. As the year winds down, our franchise offices show no signs of slowing production! They continue to help their client buy and sell homes and save money in the process. Here are our top producers for November 2014. 1) Sitting at the #1 spot again, Help-U-Sell Honolulu Properties closed a lucky 13 sides, two buyer sides and 11 seller sides. 2) Close behind with a dozen sides, Help-U-Sell Distinctive Homes in San Diego kept things symmetrical with three buyer sides, three seller sides, and three dual-sided transactions. Broker/owner Marty Castro donates $100 from every closing to his local Big Brothers Big Sisters chapter, so he also made a $1,200 contribution last month. Way to go, Marty! 2) Tied for second place, Chino Hills’ Help-U-Sell Prestige Properties finished the month with two buyer sides, six seller sides, and two dual-sided transactions. 3)Help-U-Sell Detwiler Realty, in Carlisle, Penn., closed 10 sides: one buyer, five seller, and two dual-sided transactions. 3) Completing our list for November, Detroit-area Help-U-Sell Metropolitan had six buyer sides, two seller sides, and one dual-sided transaction. We also want to give an honorable mention to our offices that helped clients sell properties for more than $1 million, saving the sellers thousands in commission. Great work, Help-U-Sell Action Properties, Help-U-Sell Prestige Properties and Help-U-Sell Westside Realty. Help-U-Sell Direct Savings Real Estate is tied for second place in our top producers list for March. It might still be cold in some parts of the country, but spring arrived early for many of our Help-U-Sell offices. 1) Back on top, Help-U-Sell Honolulu Properties closed 14 sides last month. All but one were seller sides. 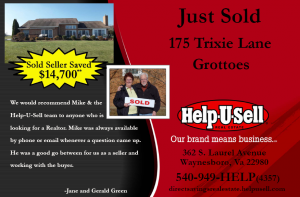 2) Help-U-Sell Direct Savings Real Estate, in Waynesboro, Va., tied for second place with 12 closed sides. Four were seller sides, two were buyer sides and three were dual-sided transactions. 2) Also with a dozen closed sides, Florence, Ala.’s Help-U-Sell Quad Cities Realty closed seven seller sides, one buyer side and two dual-sided transactions. 3) York, Penn.’s Help-U-Sell Hometown Realty rounds out the top three with 11 closed sides: four seller, three buyer and two dual-sided transactions. Congratulations to all of our top offices and the ones who almost made our competitive list for March!